Plastic robotic injection molding automates the injection molding process by using a pick-and-place robot to load plastic parts into the molding machine, as well as place the finished products onto a conveyer belt. Through this automated process, the robot is able to efficiently and accurately create injection-molded pieces. Contact us for more information on how our robot-guided injection molding process can provide you the best quality plastic profiles, or request a quote today. With injection molding projects, producing high quality, accurately cut, formed and measured molding pieces is very important. 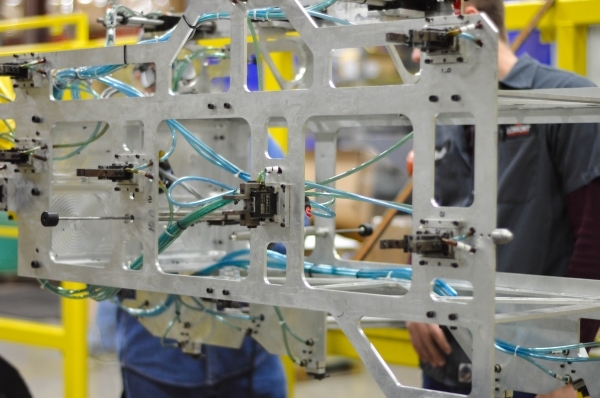 Human-operated injection molding leaves room for variation, but utilizing automated techniques leads to more flexible and precise production. This means your plastic molding will be your desired specifications and quality each and every time. This process is creating new and exciting opportunities within the Plastics industry. In traditional injection molding, plastic resin is conveyed into an injection molding machine, where it is gradually melted. When the plastic becomes liquid, it is pushed through a nozzle into a mold where appropriate pressure is applied until the cooling time elapses. Then, the mold is opened, and an operator removes the part and places it on a conveyor belt. This process is then repeated over again. With automated injection molding, however, the repetitive process is granted to robots, leaving the operators to focus on complex tasks and inspection. The production and the assembly of plastic molding can be done quicker and for reduced costs. A pick-and-place pedestal robot conveys thermoplastic material into the hopper of the injection molding machine. The hopper moves the resin into the heating barrel where the plastic is melted to a predetermined temperature, similar to the traditional process. Once the plastic is melted, a screw pushes the material into the mold and applies pressure until the plastic cools and hardens. The mold is opened, and the 5-axis robot removes the new plastic part and places it on the conveyer belt. The robot quickly repeats this process, producing parts with little to no variation between them. The integration of Robotics into plastics manufacturing has been occurring at Lomont Molding LLC (Lomont) since 1987. Starting with the basic picking robotics, Lomont has advanced to large pedestal models that can now carry out complex tasks with enhanced accuracy in the largest tonnage machines. Because we utilize our automation system so effectively, we can process your orders faster and more accurately, allowing for critical order fulfillment that is key to your inventory requirements.